Apart from measuring rates of reaction and deducing the rate law, there are other lines of evidence that can suggest how the reaction is occurring. For aliphatic nucleophilic substitution, stereochemistry of the products provides some additional evidence. Suppose you carry out a nucleophilic substitution reaction using a chiral starting material. You decide to convert (S)-3-chlorooctane into the corresponding azide. Azides are pretty widely used reagents (but slightly dangerous and potentially explosive). They are employed in a class of reactions called "click chemistry"; you've just heard about these reactions and you want to try one out for yourself. You have complete control over the mechanism of the reaction (not so easy in reality, but in this thought experiment you can set the dial on your stir plate to the desired mechanism). You choose to make the reaction occur through an SN2 pathway. You know the product will be chiral, so you plan to check its optical rotation. The trouble is, once you have finished the reaction, the optical rotation is exactly the opposite of what you were expecting, based on the values of other compounds like this one. You did the reaction successfully but got the unexpected enantiomer. You're not worried. You've been taking this nifty chemistry class and you have an idea of something else to try. This time you select an SN1 pathway. You finish the reaction and get the right product, but it shows no optical rotation whatsoever. This time you got a racemic mixture. This is just a thought experiment, but what would it all mean? 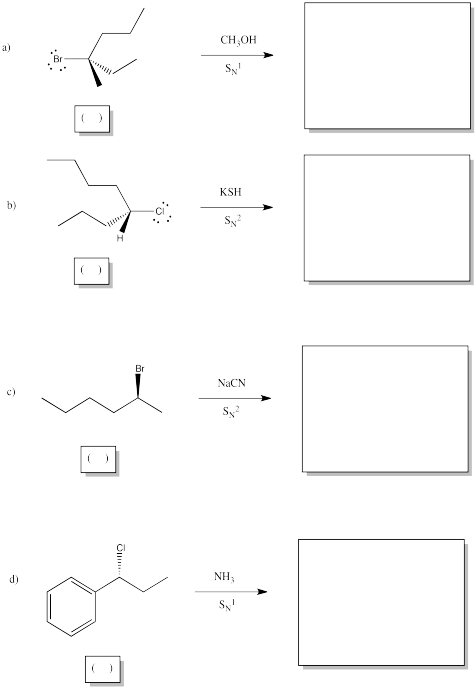 Why might changing mechanism influence the stereochemistry? This is just a thought experiment, but the results are generally true: in an SN2 reaction, the chiral center undergoes an inversion. The three-dimensional arrangement of groups around the chiral center is the opposite of how it started. In an an SN1 reaction, the chiral center undergoes racemization. There is a 50:50 mixture of enantiomers. a) Propose reasons why the stereochemistry would flip in an SN2 reaction. A drawing will help. b) Propose reasons why an equal mixture of stereoisomers would result from an SN1 reaction. A drawing will help. You may have noticed that two different solvents were used in the two reactions above. Propose a reason why this change in solvent may lead to a change in mechanism. In an SN2 reaction, the nucleophile donates electrons to the electrophilic carbon, displacing the leaving group from the other side. The nucleophile donates its electrons to the lowest unoccupied molecular orbital, which displays a lage lobe on the side of the carbon opposite the leaving group. As a result, the nucleophile always approaches from the opposite side of the electrophilic carbon as the location of the leaving group, and ends up on the opposite side from where the leaving group group was. SN2 reactions at chiral centers lead to reversal or "inversion" of the chiral center. On the other hand, in an SN1 reaction, the nucleophile enters only after the leaving group has left. At that point, the electrophilic carbon is a cation, so it is trigonal planar because it only has three groups attached to it. The nucleophile could easily approach from either side. SN1 reactions at chiral centers lead to racemic mixtures. Show the products of the following reactions, and indicate stereochemical configuration of bothe the starting material and the product in each case. The lesson here can be restated as follows: the mechanism affects the stereochemical outcome of the reaction. Explain why that fact is important in the context of making a chiral drug for the pharmaceutical market.